My house is a way smaller version of hers, so sadly it isn't as crisp, but it's a house none the less. I had a problem with my new yellow I got... it smudges everywhere! I constantly had to keep fixing that damn moon! Just out of curiosity, lets see how many of you actually read this little description. Put <3 <3 <3 if you read this! *edit* Holy crap, I didn't realize how MANY of you read this. I'm impressed! Haha! I now understand! 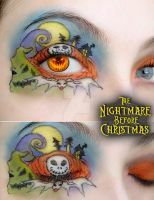 Tim Burton's Nightmare before Christmas is a much repeating theme in all areas of art and for a reason. Most everyone love this movie and the feeling of it and share fond memories from childhood watching this on Halloween. Even we who don't celebrate Halloween share warm memories of this movie. The work itself is a very well executed piece of art with vivid colors and much detail. It manages to keep true to the original feeling of the theme and it certainly does raise the same warm and fond feelings of childhood as the movie does. The colors are incredibly beautiful especially on the green ghost and the night sky which are very vivid. The canvas (the eye-area of the model) is flawless and servers as a great base for the work. I like how the lashes kind of get to play a part in this work, too. All in all I love it! And I think Tim Burton would love it. It is adorable, , magnificent and very well done. Thank you very much for this inspiring piece of art and have a great day! 241 out of 246 deviants thought this was fair. What makes people fresh and original is the use of the existent concepts in different media. this is by all means different - the use of personal, bodily architecture and thus adapting the familiar construct to a demanding surface like ones face is undoubtedly praiseworthy. Blending several motives into just to small spaces requires not only vision, but precision. Moreover, though not the original idea in using body, namely the skin and eye area as a canvass renders the vast possibilities that years for uniqueness such as the one above. In that respect, one should consider and acknowledge the perfect use not only of that canvass, but also its "appendices", in other words, facial hair, that adds the three-dimensional aspect to the whole artwork. As such it perfectly uses the surface (skin and face) configuration to depict different textures: night sky, pumpkins, the Moon and, finally, the ground. 166 out of 180 deviants thought this was fair. 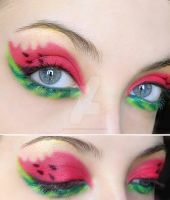 <3 <3 <3 this if fabulous! My daughter screamed when she saw this... She is a HUGE nightmare fan!!! *doesn't feel like singing the rest* , cam someone finish it for me? Love it, just love it here girl! Woooooaaah. This is amazing! Amazing talent. I love this movie! This is amazing, this is amazing, THIS IS AMAZING!!! A boy I really loved since like I don't know when. Apparently we had 1st grade together...and then we were in the same middle school... and then several classes after that and then we had some high school classes together... It's complicated. I can't even remember when I first met him. 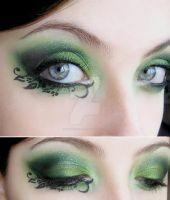 Anywho- I think he would love this on me. Would make me 100% more attractive in his eyes. I could pair it up with an entire outfit centered around yellow and purple to really draw attention to the blue and yellow in the eyeshadow I think. I really love Jack, he's an awesome character. Dear God, I can't even remember what the point of this entire comment was. I think the point is- I really love this piece. This is pretty cool. I like it. Really a charming look--very well executed, and definitely captured the spirit of the film.